It's as though Christmas has come in July! 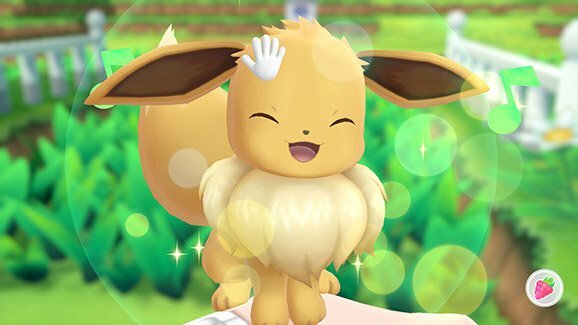 Overnight, there was a massive release of information regarding Pokémon: Let's Go, Eevee! and Pokémon: Let's Go, Pikachu! 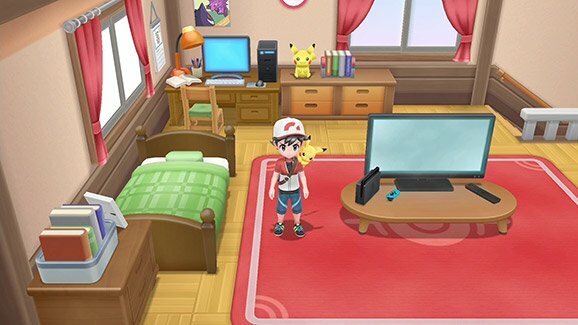 That includes details on version differences, catching Pokémon, battling other trainers, the Kanto region, cities and gyms, Pokémon interaction, and playing with friends. Phew! That's a lot to get through. When it comes to the two versions of the title, the obvious difference is the starter Pokémon. 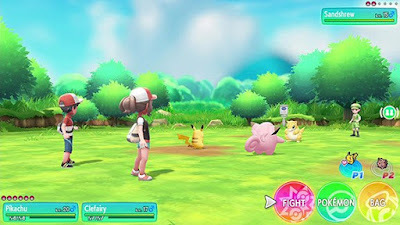 However, some wild Pokémon may only be able to be caught in one version of the game or the other — for example, Bellsprout, Vulpix, and Meowth can only be found in the wild in Let’s Go, Eevee!, whereas Oddish, Sandshrew, and Growlithe can will only be spotted in the tall grasses of Let’s G,o Pikachu! For those familiar with the base Pokémon series, capturing your new friends in the wild will be... well, familiar. Wild Pokémon still hide in tall grass, although you’re now able to see them. To capture them, approach to trigger the battle. Now begins the incorporation of those infamous Go ball-throwing mechanics. The Pokémon will move around and try to intimidate you, while you focus on the perfect time to throw a Poké Ball. Here’s where things get a bit murky: it seems — though if I’m wrong please correct me — that Nintendo hasn’t bothered to include accessibility controls for those with limited mobility. Either wave the Joy-Con controller or, in handheld mode, move the entire system around to aim and press the A button to throw. That means if you can’t move your hands/wrists properly, you’re completely excluded from playing. That would include me, which isn’t the first time and won’t be the last. So again, please, if I’m wrong, let me know! Related reading: Lots of Let's Go! information was revealed at E3 2018's Nintendo Direct, and you can read my recap here! Anyway, your odds of catching the given Pokémon depends on your timing and where the ball hits the target. 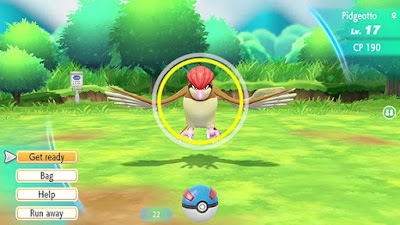 A green ring means it’s easy to catch, whereas a red one means it’s more difficult.atching wild Pokemon will give the Pokemon in your party Exp. Points. Once a Pokemon has gained enough Exp. Points, it will level up. Your Pokemon’s stats will increase when they level up, and sometimes the Pokemon will even learn new moves! Different Poké Balls have different catch rates, or berries can be used to tame the wild creature. Pokémon: Let’s Go! also includes other trainers in-game, so you’ll be battling them along the way. If they see you, you’re pulled in — and the battle functions much like it would in prior Pokémon titles. You can select moves, swap Pokémon, or use items during the battle, and a win will earn any Pokémon used in battle experience points, as well as you some much-needed money and maybe Poké Balls. 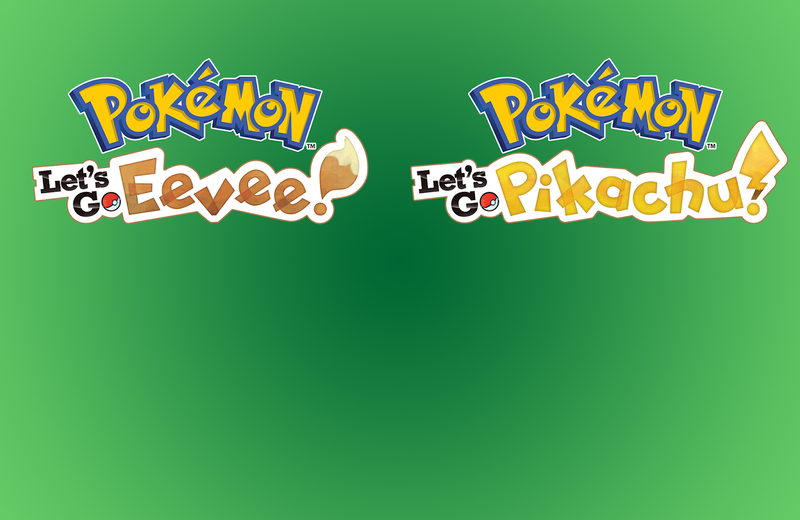 Both versions of Pokémon: Let’s Go! are based on Pokémon Yellow’s Special Pikachu Edition, which was released in Japan two decades ago this year. As such, Let’s Go!’s location is a very familiar one: the Kanto region. It’s the same yet oh-so-different after all this time! The journey begins in your home of Pallet Town, in which Professor Oak also happens to reside. He’s the one that gifts you the Pokédex and sets you en-route to the adventure of a lifetime. The Kanto region is made up of all types of places: from small towns and big cities to small meadows and rolling hills, it’s a special place indeed. Some cities contain Pokémon Gyms, the true test of a Trainer’s abilities. Once you meet the given conditions for a Gym you can enter, face off against several opponents (each more challenging than the next), and eventually be up against the feared Gym Leader to earn a Gym Badge. Hint: your first Leader will hold Rock-type Pokémon and the second, Water-type. One of the sweetest part of Pokémon: Let’s Go, Eevee! and Pokémon: Let’s Go, Pikachu! may just be the way that you can interact with any Pokémon you’ve taken as your traveling companion. They can sit on your (in-game) arm and allow you to feed, pet, or tickle it. These interactions, in turn, strengthen your bond with the Pokémon, making you a stronger pair overall. You can even dress alike, as game imitates life between companion pets and their obsessive owners. Keeping someone by your side allows them to grow as well as find hidden items. I remember sitting around in the hallways of my high school, using cables to attach Game Boys and trade Pokémon. Thankfully (or maybe not...), technology has grown since then, and now you can connect wirelessly to explore the world together or battle. Keep in mind that by the time the game launches you will need to pay for the Nintendo Switch Online service to actually play with friends, unless you’re simple battling them via local wireless. When traveling together (limited to pairs) in Support Play mode, both players can have their own accompanying Pokémon. Your chances of catching a wild Pokémon go up with a precisely-synchronised Poké Ball throw. 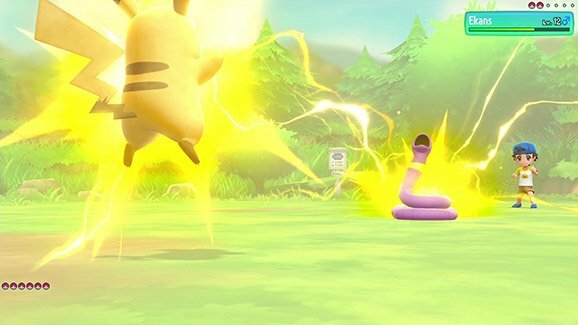 Against other trainers, you’ll both be able to control a Pokémon and its commands during battle. By connecting with another player, either via local communication or internet communication, you can battle or trade with them. Pokémon: Let’s Go, Eevee! and Let’s Go, Pikachu! will be released simultaneously and exclusively for the Nintendo Switch on November 16.